Managing Editor Matt Thacker makes his selection from the Summer 2017 issue. We publish one article from each edition on the website, but you can see the rest if you subscribe or buy a single issue or four-issue bundle. Matt has opted for Jonathan Liew’s piece on the genesis of Shane Warne’s extraordinary mural. When I found out that Jonathan was writing a piece that suggested Warnie’s mural was painted from real life, meaning JFK, Elvis, Marilyn, Springsteen, Sinatra and the rest had actually been at one of Shane’s dinner parties, I couldn’t wait. What I wasn’t expecting was that the whole thing had all been Jason Gillespie’s genius idea. Fantasy cricket at its best. The film crew had been through almost every room of the house, and were just about to leave when the producer spotted the mural. At first, she thought nothing of it. Shane Warne’s house in the Melbourne suburbs was like a shrine to bad art. The motivational posters featuring tropical sunsets and soaring eagles. The Matisse rip-offs that looked like a child’s school macaroni project. The Barack Obama “Hope” poster, but with Merv Hughes in the main role. This, however, was on an entirely different scale. When the programme eventually aired on Sky Sports in 2015 under the title “Shane Warne: Living the Dream”, Warne was widely ridiculed for his vanity. Warne feigned indifference, but deep down he allowed himself a wry chuckle. Sure, he could be a touch outspoken at times, perhaps even unsubtle. But vanity was the last thing you could accuse him of. Besides, he knew the truth. The mural was not some fanciful imagining of an idealised poolside reverie. It had been painted from life. Darkness washed over The Oval like a cruel sea. The champagne corks on the outfield would not be seen again until morning. The confetti danced alone. Moths flapped at the pavilion window, the only square of light left in the ground. Inside the Australian dressing-room, however, illumination offered no solace. For much of the evening, they had laughed and drunk away the pain. The English came in to visit, but had not stayed long, eager to clamber into their waiting taxis and begin the festivities in earnest. And so the Australians commiserated alone, flipping open the bottles of Victoria Bitter that had been purchased for victory but would do just as well in defeat. A taut and awful silence gripped the room. Simon Katich stared at the backs of his hands. Shaun Tait blew a one-note tune across the neck of his bottle. The silence was momentarily broken by a cricket ball rolling off the bench and hitting the floor with a thud. The click of a cigarette lighter interjected before Gilchrist could respond. From behind a tall stack of pizza boxes, the slumped and cetacean figure of Warne slowly winched itself upright. Warne inhaled slowly and exhaled with violence, an angry cloud of smoke pouring from his mouth. Warne paused for effect. “Nobody, that’s who,” he said. He had developed a habit of answering his own rhetorical questions, a trait that grated on colleagues to an unfathomable degree, and which they would occasionally remark upon when he was out of earshot. But before they could dwell on their irritation, Warne continued. Again, there was a certain sceptical silence. Every single person in that room had first-hand experience of one of Warne’s “mega-parties”. Invariably, they failed to live up to their advance billing. Often, spectacularly so. One time, the promised “A-list celebrities from the world of acting” had turned out to be Alf and Ailsa from Home and Away. Then there was the time, a few years earlier, when most of the Australian team and their partners had turned up in anticipation of a “sumptuous moonlight dinner”. When they arrived, they found that Warne’s hot tub had been drained and filled with chips. But it had been a long summer. Playing in the greatest series of all time takes a toll on the body, but it takes a toll on the mind as well. Nobody was in the mood to arrest Warne’s flight of fancy. Many were already allowing their thoughts to wander homewards, to their own beds and home-cooked food and towels they had chosen themselves. An unidentified yawn from the back of the dressing-room – it may have been Justin Langer, who had been up since 4am doing tai chi – seemed to spread like contagion. One by one, the Australians started stretching and rubbing their eyes and picking up their bags and drifting towards the door. “We’ll have a barbecue,” Warne announced as their descending footsteps cast echoes back up the stairs. “How’s second week of October suit everyone?” But nobody was listening any more. Warne pushed the plate across the table, rapt in thought, or perhaps the lack of it. It was six months after the Ashes defeat and his party plans had yet to find any kind of definite shape. October had been a non-starter; most of the team had discovered immovable prior arrangements that prevented them from attending. So too November. December and January, at the height of the summer, were no good for anyone. Meanwhile, a quick blast on Wikipedia had proven Buchanan right. Many of the prospective guests were now dead. But over a hastily arranged lunch in Fitzroy, Gillespie was enthusing about a potential solution. Warne looked unconvinced. It was not that the prospect of time travel was unappealing to him, or that the science underwhelmed him. It was more that he did not see the point. Why live 200 years in the future when you could live now, with the certainties of the present, when you knew where everything was in your fridge, and you had a pretty good idea what would be on TV that evening? Besides, people in the past would never have heard of him, and people in the future might already have forgotten him. He banished this last thought with a violent, involuntary shake of the head. Warne nodded, a gesture that concealed a comprehension that was only partial. Over the months, the guest list had grown in his head. It now included Marlon Brando, Martin Luther King, Buddy Holly and Mother Teresa. But in his head it had remained, until Gillespie had called up out of the blue and asked to meet. Now he was talking about valvetrains and drive belts and hooking a spinning cricket ball up to his motorcycle engine. Warne pondered as he lit a cigarette. All sorts of thoughts were running through his head. What if Dizzy could actually pull this off? Even if he could go back in time and find JFK and Elvis Presley, how would he convince them to come to a party in Melbourne? And who was Genghis Khan? He could have sworn he had heard that name someplace. Indian? Off-spinner? 1950s? “Not famous enough,” he thought to himself, and mentally scrawled his name off the guest list. Once Gillespie got the bike running, things started to move pretty quickly. Warne sat pillion and operated the spinning motor: leggie to go back in time, slider to go forward. “It’s so quiet,” Gillespie remarked breathlessly as the years began to tick away, as the sharp edges and definite shapes of the garage around them began to blur and melt and warp and fade. The only sound was the ambient fizz of the Kookaburra ball behind them, wobbling furiously on its own axis, held in place only by its own eerie volition. “It’s like a county game,” Warne scoffed. Some guests were easier to persuade than others. Mother Teresa refused on grounds of taste. Princess Diana offered her apologies, but she was due to be appearing in a haunting in Bristol later that afternoon and she had always prided herself on being a lady of her word. Buddy Holly had, for some reason, developed an aversion to long-distance travel. Monroe was sceptical, but agreed to come when she found out Kennedy would be there. Kennedy instantly agreed to come when he found out Monroe would be there. He told Jackie he was going to a Pacific trade summit. But the big fish was Elvis Presley, who agreed to meet them at Graceland in 1972. Sprawled across his luxurious white-leather sofa, Presley refused point blank to accompany Warne and Gillespie to the future. The present was where his life was, and it contained all the food and prescription drugs and heartbreak he could ever want. It took all Warne’s powers of persuasion to lure Presley off his sofa and into the 21st century. “What are future generations going to say,” he said in a vaguely scolding tone, “when they find out that the end of the world was coming, and you could have prevented it?” He paused for effect. “I think they’d find that pretty ordinary, if you ask me,” he added. “Not as such, no,” Kennedy replied. Dimitri Mascarenhas looked, if anything, a little lost. He tried to strike up a conversation with Presley, but seeing as Mascarenhas had never listened to Presley’s music and Presley had never watched a Hampshire CB40 game, their chat quickly fizzled out, and Mascarenhas spent most of the afternoon picking at a bowl of Doritos and wondering what on earth he was doing there. Sinatra requested some music: “Connie Francis, if you have it.” Warne said he would search his iTunes library but might have to resort to one of his playlists. Sinatra, polite to a fault, had no objections. And so it is that in the painting, the tune that Sinatra and Ali are belting out is “Somebody Told Me” by The Killers. Warne circled the party in quiet contemplation, quietly marvelling at the tableau he had brought together. It all felt too surreal for words. Was that really Muhammad Ali reaching for the prawn skewers? Was that really Angelina Jolie lounged half-naked over a chair he had never seen before in his life? Was that really Anthony Hopkins in the character of Hannibal Lecter, flipping brains over on the barbecue? In a funny way, he still had his doubts. Ever since he was young, he had always had a vivid imagination. 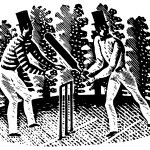 It helped him as a bowler, too: not until late in his career did he realise that his ability to envisage what a batsman would do before he did it was not a skill all humans possessed, but a preternatural, almost supernatural, talent. There were times when he felt like an actor, in a film he had already seen many times before. It had all gone more perfectly than Warne had dared to hope. Everybody was getting on famously. Sinatra and Michael Clarke exchanged telephone numbers and agreed to go for a drink the next time they were passing through the same spacetime. Bruce Springsteen learned how to bowl a googly and promised to teach the E Street Band when he got back home. Everybody was having so much fun, in fact, that nobody even noticed the two large trucks pulling up outside the back gate; one bearing a giant water pump, the other carrying 150 industrial-sized bags of chips. Later, after the last of the guests had left and the sun was finally receding, Warne went back inside the house. He saw his phone on the dining table, and instantly a cold dread settled over him. Even before unlocking the home screen, he knew what he would find. There were 19 missed calls and eight unread texts from Gillespie. He had been at the front door all day, pleading for someone to let him in. “No worries,” Warne said, but the film crew were already opening the door by that point. Warne fancied he saw a couple of them smirking conspiratorially to each other. They left promptly and without a second glance, and so they did not see the cricket ball above the garage door, hovering a few inches below the ceiling, still furiously spinning. 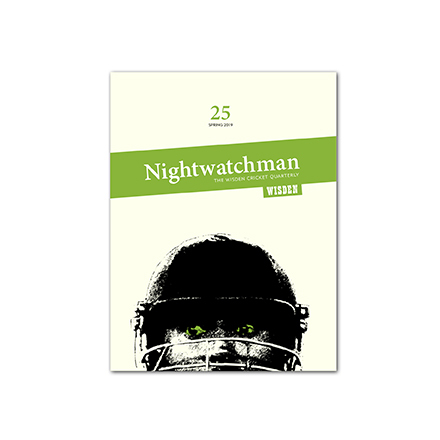 Issue 18 of The Nightwatchman is out now and available in both print and digital formats.